Is there a right time and place to fly? Find out in the Feb/March issue of S&G, which includes tips on simple thermal centring techniques you can rely on when the chips are down. 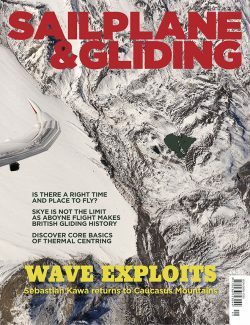 You can also read about the flight to the Outer Hebrides that made British gliding history, and more of Sebastian Kawa’s gliding adventures in Russia. When IS the cross-country season and are there any patterns, by region or over the years, that might indicate when we should or shouldn’t skive off work or hold competitions? The BGA Comps and Awards Committee has been analysing UK cross-country flights between 2009 and 2016 to see what, if any, patterns arise. So, you’ve decided that today is the day for that epic cross-country. Make sure you have read the top tips Tony Cronshaw has extracted from leading coaches on thermal centring in the first of a two-part Ask the Coach article. Mike Fox and Sebastian Kawa outline simple thermal centring techniques that you can rely on when the chips are down. In late September 2016, German pilots Christof Maul and Thomas Seiler took off from Aboyne for the epic cross-country that was to make British gliding history. Launching by aerotow at 07:15, they flew to the Outer Hebrides and back to Aboyne, landing at 17:38 and having flown 713.4km at a speed of 70.9km/h. Although this is not the longest flight done from Aboyne, it is believed to be the first time a glider has flown to the Outer Hebrides. Sebastian Kawa returned to Russia in September 2016 to realise his ambition of flying in wave in the Caucasus Mountains. A second venture into uncharted territory provided challenging, unforgettable flights (and landouts), plus a whole gallery of stunning photographs of wild peaks. Sebastian is already considering a third visit. Also in this issue: David Innes reports on a wave week to remember, which started with five Diamond heights. John Bridge reflects on a bone-shaking flight that saw him almost reach Mont Blanc. Andy Davis and Mike Young report from the Sailplane Grand Prix Finals in South Africa. Andrea Abt flies with the champions in Namibia. Debb Hackett reports from Harris Hill in part four of Willy’s Schweizer saga. Chris Fox and Ed Downham provide an Airprox update. Dave Latimer looks at attracting and keeping people at clubs. Pete Stratten provides an update on EASA developments. Bruce Stephenson gives a round-up on vintage events in 2016. Kevin Atkinson explains what Aim Higher activity is planned for 2017, in the UK and Alps. Plus, there are many more of your stunning images in the Gallery pages. Is there a right time and place?